Situated in central Andalusia, Cordoba is a living museum, filled with many architectural pieces that act as a reminder of its rich history. The Great Mosque of Cordoba (La Mezquita) is considered one of the most spectacular of the Moorish era, making it the city’s pride and joy. Northwest of the mosque lies the Jewish Quarter (Juderia), which is dotted with remains of the medieval ghetto, offering the perfect walk to the Museo Julio Romero de Torres, which highlights Cordoba’s most famous painter’s best work. Other pieces to marvel at include the massive Roman Bridge of Cordoba, the Roman temple of Cordoba, and the Cordoba synagogue. Another quirky find is la Calleja de las Flores (Little Street of Flowers), a perfect, narrow alleyway where locals show off their immaculate patios and potted plants. Also located in the ever-beautiful Andalusia, Granada is set in the foothills of the Sierra Nevada mountains. Tucked inside the massive mountainous surroundings are more architectural gems. The city’s pride and joy, la Alhambra, is a medieval fortress that is the pinnacle of Moorish culture, still bursting with gardens, patios, fountains, ponds, and paths that look out over the city. Be sure to book tickets ahead of time here, since its UNESCO World Heritage Site name means it attracts up to 6,000 visitors daily in the summer months. Also, enjoy the renaissance architecture of the Palace of Charles V, the Granada Cathedral, and the Monastery of Saint Jerome. Famous for its flamenco, Seville is best enjoyed during Semana Santa (Holy Week) at the beginning of April, which marks the last days of Christ’s life. It is one of the largest festivals in Spain, and Seville’s cobbled stoned streets are filled with polka-dotted flamenco dresses, live music, and hundreds of candles. Be sure to visit the famous Alcazar, a royal Moorish fortress built in the 1300s which now holds UNESCO World Heritage Site status. In the evening, explore the colorful flamenco history at the Museo de Flamenco, and enjoy the hour-long show at seven. Finally, awe in the massiveness of la Plaza de España while peeling one of the region’s world-famous, perfect oranges. 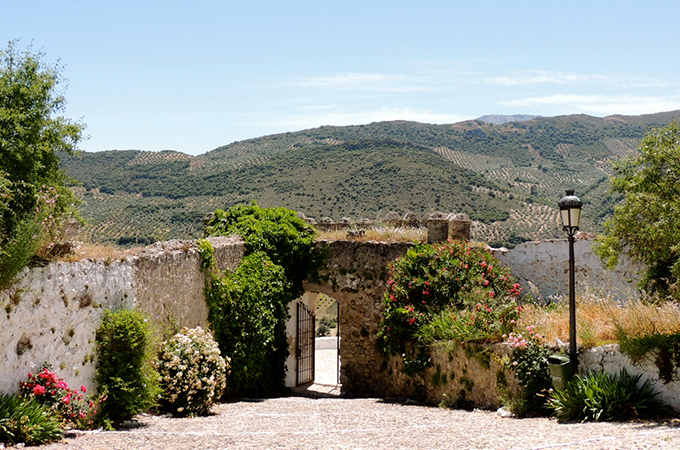 As the third most-visited city in Andalusia, Ronda certainly has a lot to offer. We suggest enjoying the incredible views from Puente Nuevo (New Bridge), which took forty-two years to build, and then strolling along the Camino de los Molinos, which is covered in a blanket of flowers in the springtime. The Romantics were also drawn to the beauty and mountainous Ronda, attracting those such as Ernest Hemingway, Orson Welles, and David Wilkie. Plaza Duquesa de Parcent offers many monuments and the famous Santa Maria del Mayor church, which took over two centuries to build. But of course compared to Barcelona’s La Sagrada Familia, that’s nothing! This waterfront town, well known for its tranquility and easy living, offers a more authentic glimpse into small-town Spanish living. The Valdearenas Beach sits on the side of Iznajar, where visitors can swim, fish, canoe, and even learn how to sail. The Moorish castle that looms above the red roofs of the traditional white village houses offers outstanding views of town, while the Iglesia de Santiago is from the fifteenth and sixteenth centuries. Finally, get lost in the maze that is Barrio del Coso, and then enjoy one of the many local pork dishes this region is known for. Watching above are the Gibralfaro Castle, the Alcazaba, and Roman Theatre, which offer an afternoon walk filled with fountains, gardens, and castle courtyards. After visiting the Picasso Museum and La Manquita, enjoy a glass of Málaga wine and take grilled sardines next to the beach. Once full, finish your day by reliving your childhood at Tivoli World, a Spanish amusement park in the city center. When visiting this Mediterranean scene be sure to first rent a bike and enjoy Turia Gardens, a local favorite. When looking for lunch head to the Central Market, which is flooded with fruits and veg, local meats and poultry, and fresh-squeezed juices. If you’re looking to sit down, enjoy paella, and then continue to explore the City of Arts and Sciences. Despite the futuristic buildings that now populate the city, Valencians appreciate the surrounding nature including parks, wetlands, and beaches. As Spain’s capital, Madrid is the country’s bustling and electric center. Filled with some of the top museums in the country, including the Museo Nacional del Prado (the national Spanish art museum), the Museo Thyssen-Bornemisza (another outstanding art museum), the Railway Museum (housing one of the largest railroad collections in Europe), and the Museo Nacional Centro de Arte Reina Sofía (featuring 20th-century art). Enjoy the vast plazas signature to the city, including Plaza Mayor and Puerta del Sol, and then sip on Sangria at the Mercado San Miguel. The Royal Palace is one of the grandest in Europe while the Buen Retiro Park offers a serenely green escape. Situated in northern Andalusia, Úbeda (and its neighboring town, Baeza) is surrounded by its signature olive groves and is stacked with its regional specialty: pottery. See hundreds of years of its pottery displayed at the Museo de Alfareria, and be sure to stop by Tito’s shop, which has been nationally recognized since 2006. Although language may be a small barrier, you’re in for a treat if you’re lucky enough to step in while he’s there. Most of Úbeda’s beautiful Renaissance buildings, including the Palacio de las Cadena and the Capilla del Salvador, are located within the city’s plazas. If you stop for a drink, hold off on ordering tapas until your drinks arrive since your drink may just come with one. Interested in seeing the best of Spain? See it on a Spanish Untour! With perfectly placed apartments in Barcelona and Andalusia, there is no better way to see these Top 10!